Kortrijk, Belgium (April 19, 2018) – Leveraging Barco’s long history of market leadership in cinema laser technology and it success with RGB Flagship Laser projection for Premium Large Format screens, Cinionic, the Barco Cinema joint venture, now turns its attention to smaller screens. Today, Cinionic announces a new Smart Laser High Contrast (HC) projector series designed to deliver stunning image quality never-before-seen in this footprint. Based on the Barco Smart Laser projector platform, the HC models are highly efficient and cost effective, overcoming the typical challenges of creating high-contrast movie images for smaller screens. 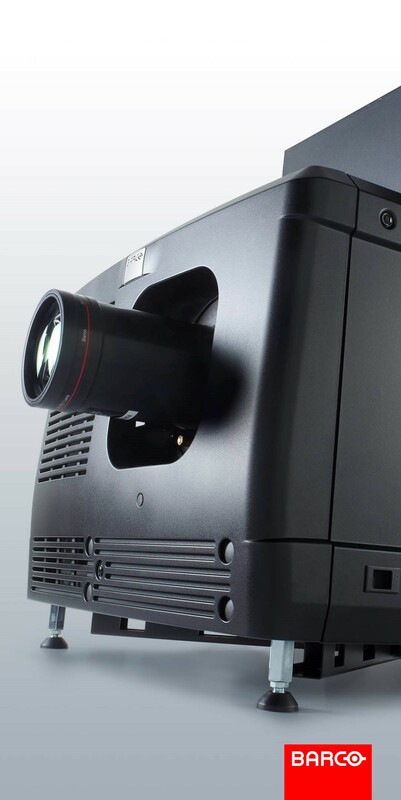 Offering an excellent value proposition for movie exhibitors, the new projectors feature consistent laser image quality, native 4K resolution, enhanced ANSI and native contrast, proven DLP technology, and a long lifetime. All of these reasons combined make them the ideal solution to power an all-laser multiplex. With this extension of the High Contrast range, Cinionic underlines its commitment to deliver the right projector for every screen to ensure the best movie experiences in every auditorium. The new High Contrast models (DP4K-13BLPHC and DP4K-18BLPHC) are EclairColor HDR certified, presenting images with enhanced contrast and fidelity to more accurately represent the vision originally intended by the film’s creative team. A new technology, EclairColor combines an innovative mastering process with optimized display technologies readily available on the market from CinemaNext. The DP4K-13BLPHC (11,500 lumens) is ideally suited to small- to mid-size screens and the DP4K-18BLPHC (16,000 lumens) is designed for mid-size screens. Both models are available to order now. Attendees at CinemaCon in Las Vegas can experience the new Smart Laser High Contrast projectors by visiting our Experience Center at the Caesars Palace hotel from Tuesday, April 23 – Thursday, April 25. Cinionic is transforming cinema, providing comprehensive WOW entertainment solutions to movie exhibitors across the globe. We help turn imagination into reality and ensure peace of mind for our customers by offering innovative services and flexible use of capital for a new era. Combining the technology expertise and heritage of our partners, Cinionic powers exceptional experiences across the entire theater to engage visitors at multiple touchpoints in their cinema journey.Cinionic is a joint venture among Barco, Appotronics, and CFG, with offices in the United States, Belgium, Hong Kong and Mexico; the legal entity is planned to take effect mid-2018. Visit www.cinionic.com and follow us on Twitter, LinkedIn, Facebook or YouTube for more info. For more information, visit us on www.barco.com, follow us on Twitter (@Barco), LinkedIn(Barco), YouTube (BarcoTV), or like us on Facebook (Barco).